42nd Street New York City, 24×36 in. This painting has been sold, however gallery wrapped giclee prints are available. 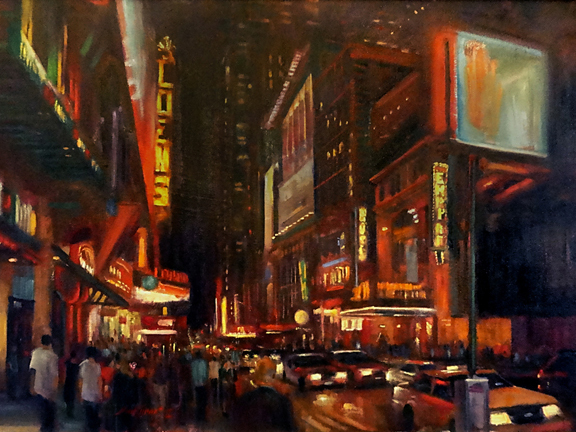 42nd Street, New York City, is an original oil on canvas painting that is part of a series of urban nocturnes. This original painting is available for purchase, and we have various other NYC paintings available, too. Gallery wrapped giclée prints are also available in sizes ranging from 8×10 to 30×40 inches, which are perfect for the home or corporate office. 42nd Street is a major crosstown street in the New York City borough of Manhattan, known for its theaters, especially near the intersection with Broadway at Times Square. It is also the name of the region of the theater district (and, at times, the red-light district) near that intersection. The street has held a special place in New Yorkers’ imaginations since at least the turn of the 20th century, and is the site of some of New York’s best known buildings, including (east to west) the United Nations, Chrysler Building, Grand Central Terminal, Times Square and the Port Authority Bus Terminal. The corner of 42nd Street and Broadway, at the southeast corner of Times Square, was the eastern terminus of the Lincoln Highway, the first road across the United States, which was conceived and mapped in 1913. The Lincoln Highway proceeded west on 42nd Street to the Weehawken Ferry. New York City is located on the Eastern Atlantic coast of the United States, at the mouth of the Hudson River. The city center resides at the exact location of 40 degrees, 42 minutes, 51 seconds N latitude, and 74 degrees, 0 minutes 23 seconds W longitude. New York City is made of five boroughs, each of which is a county. Brooklyn (Kings Co.) and Queens occupy the western portion of Long Island, while Staten Island (Richmond Co.) and Manhattan are completely on their own land masses. The Bronx, to the north, is attached to the New York State mainland.